One of the original 13 colonies, New York is represented by a star and a stripe on the 13 star U.S. flags. Charge. Azure, in a landscape, the sun in fess, rising in splendor or, behind a range of three mountains, the middle one the highest; in base a ship and sloop under sail, passing and about to meet on a river, bordered below by a grassy shore fringed with shrubs, all proper. Crest. On a wreath azure and or, an American eagle proper, rising to the dexter from a two-thirds of a globe terrestrial, showing the north Atlantic ocean with outlines of its shores. Supporters. On a quasi compartment formed by the extension of the scroll. Dexter. The figure of Liberty proper, her hair disheveled and decorated with pearls, vested azure, sandaled gules, about the waist a cincture or, fringed gules, a mantle of the last depending from the shoulders behind to the feet, in the dexter hand a staff ensigned with a Phrygian cap or, the sinister arm embowed, the hand supporting the shield at the dexter chief point, a royal crown by her sinister foot dejected. Sinister. The figure of Justice proper, her hair disheveled and decorated with pearls, vested or, about the waist a cincture azure, fringed gules, sandaled and mantled as Liberty, bound about the eyes with a fillet proper, in the dexter hand a straight sword hilted or, erect, resting on the sinister chief point of the shield, the sinister arm embowed, holding before her her scales proper. Motto. On a scroll below the shield argent, in sable, Excelsior. State flag. The state flag is hereby declared to be blue, charged with the arms of the state in the colors as described in the blazon of this section. In 1882, the legislature adopted the arms of the state that had first been designated in 1778. The flag was adopted in 1901 and modified in 1909. While every depiction of the New York State flag which I have seen omits the face on the sun, every actual modern flag I have seen does have the face (and I have seen quite a few- and I have made a point of checking to be sure the face was there). Usually the face is done in red thread, but occasionally it is a dark blue or black (not sure which, or if both). A few weeks ago I saw one which I at first thought was an exception to my previous experience about the face always being present. At first looking at one flying from a pole set several stories above the ground I did not see the face. However, after I had walked past and turned back to look at it one more time, with the real sun back-lighting the flag, and shining through the fabric, the face did appear as a shadow, since its threads were more tightly woven than the surrounding fabric. Upon closer examination I saw that, for whatever reason, the face had been embroidered in yellow thread stitched on the yellow sun. These are from a great website, by the way: the conserved battle flags collection of the New York State Military Museum: www.dmna.state.ny.us/historic/btlflags/electronindex.htm. The New York coat of arms is blazoned in New York State Consolidated Laws, Chapter 57, Article 6, § 70 as "Azure, in a landscape, the sun in fess, rising in splendor or, behind a range of three mountains, the middle one the highest; in base a ship and sloop under sail, passing and about to meet on a river, bordered below by a grassy shore fringed with shrubs, all proper." The law defines the crest as "On a wreath azure and or, an American eagle proper, rising to the dexter from a two-thirds of a globe terrestrial, showing the North Atlantic Ocean with outlines of its shores." The supporters are "the figure of Liberty proper, her hair disheveled and decorated with pearls, vested azure, sandaled gules, about the waist a cincture or, fringed gules, a mantle of the last depending from the shoulders behind to the feet, in the dexter hand a staff ensigned with a Phrygian cap or, the sinister arm embowed, the hand supporting the shield at the dexter chief point, a royal crown by her sinister foot dejected" and "the figure of Justice proper, her hair disheveled and decorated with pearls, vested or, about the waist a cincture azure, fringed gules, sandaled and mantled as Liberty, bound about the eyes with a fillet proper, in the dexter hand a straight sword hilted or, erect, resting on the sinister chief point of the shield, the sinister arm embowed, holding before her her scales proper." The motto, prescribed as being in black letters on a white scroll, is "Excelsior." This blazon was developed by a commission appointed in 1880 to develop a standard presentation of the arms of the state, which had originally been developed in 1777 and officially adopted by law on 16 March 1778 as "A rising sun over three mountains; motto underneath 'Excelsior.'" This blazon obviously does not mention the vessels on the river, or even the river itself. Early depictions, up to the time of the Civil War, do consistently show the river but not the ships or the near river bank in the base of the shield. The one exception, a depiction used on military commissions during the Revolutionary period, was the model used in 1880, which was subsequently approved by an 1882 act of the state legislature as the arms' "permanent design and legal form." This blazon was amended slightly in 1896 to its present wording. The landscape on the shield is said to represent the sun rising behind Mount Beacon over the Hudson River. The sun is variously supposed to derive from the medieval sun badge of the House of York (for the Duke of York after whom the state is named) or from the arms of Jonas Bronck, a major landowner. (The rising sun appears on the flag of the New York City Borough of the Bronx, which occupies the land once owned by Bronck and is named after him.) The ship and sloop are indicative of trade--the sloop shown is of a design typical of the up-river trade in the days of sail. The other symbols mostly speak for themselves. The motto, "Excelsior," means "ever upward." The coat of arms was used on the blue regimental flag of the 3rd New York Regiment in late 1777 or early 1778, even before it was legally adopted by the legislature. It was also presumably the principal feature of the regimental colors ordered by law to be provided to units of the state militia in 1786. The state militia regulations of 1858 provide for a white flag with the coat of arms, 10 x 12 feet, as the state flag and a blue flag with the coat of arms and unit designation as the regimental color of infantry and the standard of cavalry regiments. During the Civil War period, the New York coat of arms was impaled with the U.S. coat of arms on unit colors as well as on uniform buttons and other accoutrements of New York troops. 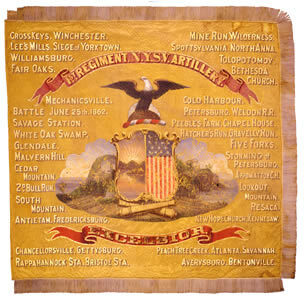 The New York State Military Museum has an on-line exhibit of Civil War-era military flags at http://www.dmna.state.ny.us/historic/btlflags/electronindex.htm; that of the 14th Regiment, NY State Militia, has a particularly interesting rendition of the coat of arms. On April 8, 1896, the New York state legislature adopted a law making the coat of arms on a buff field the official state flag (reconstructed image attached). The buff field was chosen because Major Asa Gardiner, the main proponent of the flag, argued that it should be of the facing color of uniform worn by troops. George Washington had ordered that troops from New York and New Jersey serving in the Continental Army wear buff facings. However, the buff flag was unpopular, since the actual and more familiar custom at the time was for military flags to be blue with the coat of arms, as they had been for New York troops during and before the Civil War. Thus, the legislature changed the field from buff to blue by a law enacted on April 2, 1901. The coat of arms as depicted on the flag has several minor differences from that on the state seal, or as it is shown in paintings for non-flag use. These are mainly in the treatment of the sun (squared off rays, no face on the disk) and in the simplification of the color palette for flag manufacture. The attached image is based on a scan of a technical drawing of the flag version of the coat of arms, found in the files of the U.S. Army's Institute of Heraldry, with the color scheme based on a color print of the flag provided to the Institute by the state government. From personal observation I can state that the New York State Office of Parks, Recreation and Historic Preservation flies a white flag with the agency logo. The logo is a green maple leaf, with the words NEW YORK STATE underneath and OFFICE OF PARKS RECREATION HISTORIC PRESERVATION in an arc around (shaped like an inverted U). Bullets precede and follow the word RECREATION. The home page of the Office is at http://nysparks.state.ny.us. Further information on the agency can be found at http://en.wikipedia.org/wiki/New_York_State_Office_of_Parks,_Recreation_and_Historic_Preservation. I see that bears an interesting similarity to that used by New York City Department of Parks. When the American colonies revolted from England in 1775 and 1776, they hauled down the British flag and raised a welter of ingeniously designed if strange and impractical flags. The flag adopted by New York featured a beaver on a white background. This was a proud allusion to the long and important fur trade history of New York. The beaver has long been a symbol of New York. It was featured prominently in the the period of Dutch rule, and was a part of the seal of New Netherlands. I have seen a graphic depiction of the Revolutionary-era beaver flag only once, in a photocopy of one of the old classic National Geographics. I don't know whether this was drawn from real old pictures or just the same simple written description one reads. The beaver is still the official animal symbol of New York State, and is still on the seal and therefore flag of New York City. There is even a fraternal organization of descendants of ancient Dutch settlers who bring a stuffed beaver out to their celebration every year, to solemnly pronounce, "Gentlemen, the Beaver!" "The armed ships of New York of [March 1775] are said to have had a black beaver for their device on their flag. This was the device of New Netherlands, and is still seen on the seal of the city of New York." source: Preble, George Henry. Our Flag. Albany, NY: J. Munsell, 1872. Page 137. The paper also cites "Kerrick 71" (but doesn't list any source with his name) that "The beaver was a symbol of the industry and fur trade in the colony." A modern interpretation of this flag is shown at www.loeser.us/flags/revolution.html#before. None of the published illustrations of this flag have been drawn from any actual pattern. The design we see today is another of George Henry Preble's fantasies. The "Kerrick" reference is probably to Kerrick, Harrison S. The Flag of the United States: Your Flag and Mine. Columbus, OH: Champlain Printing Co., 1925. Indeed the Beaver flag is illustrated and described on page 71. 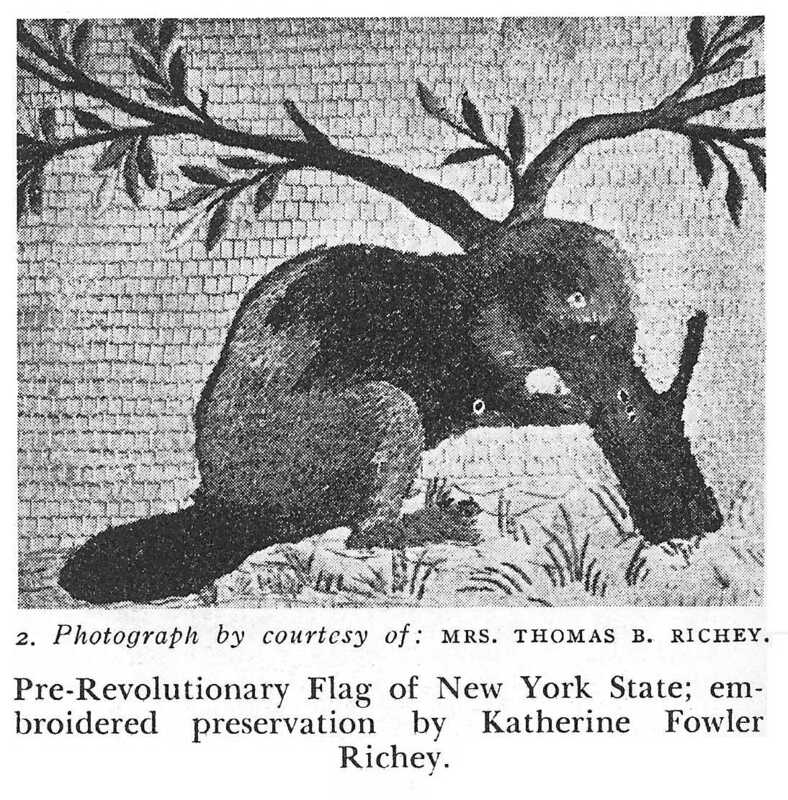 A part of an actual NY (supposedly) Pre-Revolutionary War flag featuring the Beaver gnawing on a tree is pictured on page 102 (illus #2) of Harbeson, Georgiana Brown. American Needlework. New York, NY: Bonanza Book, 1938. 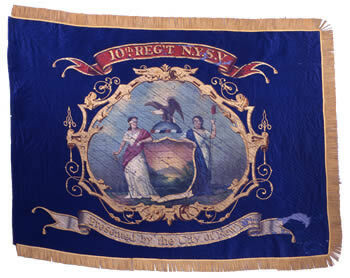 The caption reads "Pre-Revolutionary Flag of New York State; embroidered preservation by Katherine Fowler Richey. Photograph by courtesy of: Mrs. Thomas B. Richey". A scan of this image is on my web site at www.vexman.net/NYColonyBeaver.jpg. I doubt that this is an authentic pre-Revolutionary War; at best it could be a Revolutionary War military color. Seems similar to the other known beaver emblems of the day. I've never been able to figure out what happened to this flag and its whereabouts are unknown to me. The state military crest, which is the crest used in the coats of arms of units of the National Guard, as granted by the precursor organizations of what is now the Army Institute of Heraldry. The official Institute of Heraldry blazon is "The full-rigged ship Half Moon all proper. [The Half Moon was the flagship of Henry Hudson, first European explorer of New York.]"